Al Khater and Al Othman. United Development Company (UDC), a leading property developer in Qatar, has registered a net profit of QR416 million ($113 million) on revenues of QR1.5 billion for the first nine months down 13.7 per cent compared to QR482 million ($131 million) on revenues of QR1.5 billion for the same period last year. 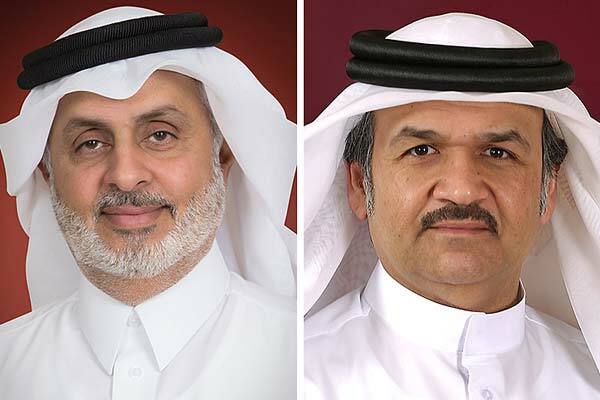 Annoucing the results for the third quarter ending September 30, the master developer of the man-made island The Pearl-Qatar said the net profit attributable to equity shareholders stood at QR385 million, while basic earnings per share was put at QR1.09. UDC’s real estate portfolio at The Pearl-Qatar includes properties for sale, comprising land plots, apartment and townhouse units, and properties for lease, consisting of office space and residential and retail units, which all are located in a self-sufficient community, stated the developer. These uniquely designed properties have an ambiance that is unmatched by other real estate developments in Qatar, it added. On the Q3 results, chairman Turki bin Mohammed Al Khater said: "UDC has achieved good performance given the challenging conditions prevailing in today’s real estate market. Our relatively strong showing under difficult circumstances was actually a testament to the quality of properties being offered at The Pearl-Qatar and to the prospective nature of three major developments being currently undertaken by UDC, pursuant to the master plan." "This aims to ensure that The Pearl-Qatar remains the premier real estate development in Qatar and the location of choice for investors, developers, owners, residents and tenants," he stated. So, while The Pearl-Qatar was already well positioned, three additional major developments - Gewan Island, Giardino Village and Al Mutahidah Towers - are being undertaken by UDC to enhance The Pearl’s experience and make it unmatched, said Al Khater. "UDC is witnessing good progress on its development projects as per the masterplan in a way that continuously brings a unique quality and character to The Pearl-Qatar of being the premier destination of real estate developments in Qatar," he added. UDC president and CEO Ibrahim Jassim Al Othman affirmed the company's dedication in advancing and executing its distinctive development projects, while achieving sound financial returns on the projects and to the company as a whole, keeping the ultimate objective of meeting the shareholders’ expectations. The Qatari developer, he stated, had awarded the construction contract for commercial showroom at Abraj Quartier district. The work is likely to be completed by the end of the fourth quarter of 2020, by which the showroom will be ready for commercial tenants, he added. Al Othman said UDC achieved growth over its recurring operational activities with a year-on-year increase in both its residential and retail leasing business at The Pearl-Qatar with occupancy rates for both business segments on the rise.